Maldron Hotel Belfast is ideally situated for business meetings, whether delegates are arriving by air or car. Only a two minute walk from Belfast International Airport terminal and easily accessible from M1 & M2. We have ten impressive air-conditioned meeting rooms, complete with AV systems, white boards, black out curtains and natural daylight. First choice for corporate events and conferences! Maldron Hotel boasts 12 impressive conference rooms, accommodating up to 250 delegates. With boardrooms and large banqueting suites, Maldron Hotel Belfast can cater for any event be it a conference, private dining party, training seminar, gala dinner or corporate event. Maldron Hotels & Partners are located in many locations throughout Ireland. The proximity of Maldron Hotels to city centres, airports and major road networks makes them an ideal base for business and leisure guests alike. A stylish 4-star hotel located in the country, Maldron Hotel Belfast is easily accessible from Belfast City and situated at Belfast International Airport. The hotel is conveniently located and just 50 metres from anywhere in the world! 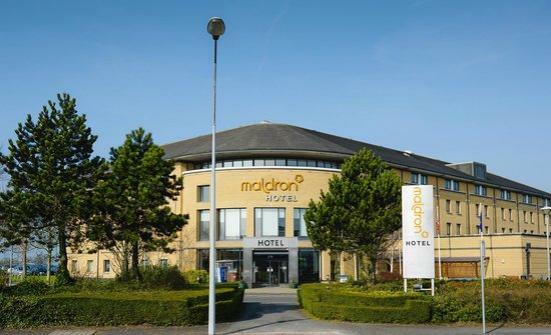 Maldron Hotel Belfast is in a primary location and central to all premier visitor attractions eg Lough Neagh, Oxford Island, Glens of Antrim, Shanes Castle and 6 golf courses are close to hand.